It is only relatively recently that the Oregon became not just a viable but an extraordinary region for growing vitis vinifera. In the 1960’s a group of dreamers were convinced that Oregon was a prime location for growing European grape varietals. This group is known as the “Pinot Pioneer’s.” They were engineers, teachers, and liberal arts graduates who had no farming or sales experience and no clue of what it took a run their own business. Nevertheless, they decided to move forward despite a number of naysayers. It all started with David Lett. Educated in viticulture at UC Davis, Lett fell in love with the Pinot Noir grape while visiting Burgundy. He became determined to find a place in North America where Pinot Noir and similar varietals could thrive and display terrior as in Burgundy. (“Terroir” is a word often used to identify wine by region; it refers to the unique flavors and characteristics of a wine based on the region where it was produced). UC Davis wine professors and wine professionals urged Lett that Oregon’s cool and wet climate would not lead him to success. Lett ignored their advice and found his spot in Willamette Valley. A number of other couples in pursuit of the same goal were soon to follow, and the group was eventually coined as Pinot Pioneers. They ripped up strawberry fields and abandoned prune orchards and began to lay down Pinot Noir vines. The families were not able to obtain loans from banks due to the common lack of confidence in the project. To battle this, they all worked second jobs to keep their families afloat, they shared equipment and knowledge, and they decided that together they would prove their critics wrong. And as we all know now, proving them wrong is exactly what they did. It took some tweaking and practice to make a vintage that was of quality, but in 1979 Lett took his Pinot Noir to an international wine show where his wine placed in the competition. His Oregon Pinot Noir beat out well know Burgundy wines—and finally, Oregon was in the game. Pinot Noir and the Pioneers truly paved the way for the expansion of Oregon’s wine industry and subsequent winemakers. These victories led to the introduction of additional varietals that have become just as successful as their predecessor. A varietal that thrives in the cool climate of Oregon and demonstrates the region’s natural acidity is Gewurztraminer. We will be pouring Teutonic Gewurztraminer from Crow Valley Vineyard in Willamette. Barnaby Tuttle of Teutonic Wine Company fell in love with German-style Rieslings while working as a wine buyer in an Oregon restaurant. In spite of being a complete novice on grape growing and winemaking he decided in 2002 that he was going to leave the restaurant industry and become a wine maker. A friend of his lent him a parcel of their farm in Alsea, Oregon where Tuttle planted 2000 vines. 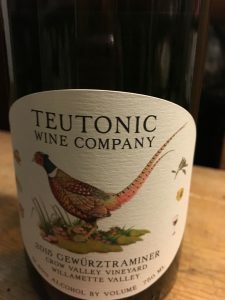 His determination lay in learning how to grow and produce a product with the same typicity (a wine’s ability to demonstrate the characteristics of the grape from which it’s made) that you find in a German wine. In my opinion he has done a great job, the moment we tasted this wine we were all very excited about the quality and the range of food it would be able to handle. This wine is crisp and ripe with a great viscosity. We decided to think outside with box and pair this with a young lamb tartar alongside the flavors of chamomile and sesame. Another producer we will be highlighting is Cristom. Like the Pinot Pioneers, they too were in the pursuit of spectacular Pinot Noir. 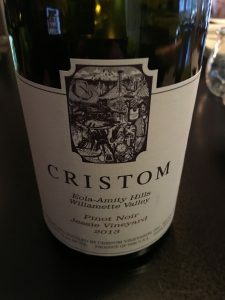 The founder, Paul Gerrie, was an engineer from the East Coast who fell in love with wine when invited to the International Pinot Noir Celebration in Oregon. He decided to uproot his young family and move west to chase his passion. Once there he teamed up with his vineyard manager, Mark Feltz, and winemaker Steve Doerner. They produced their first vintage in 1992 and have been carefully working to produce exceptional Pinot Noirs since. 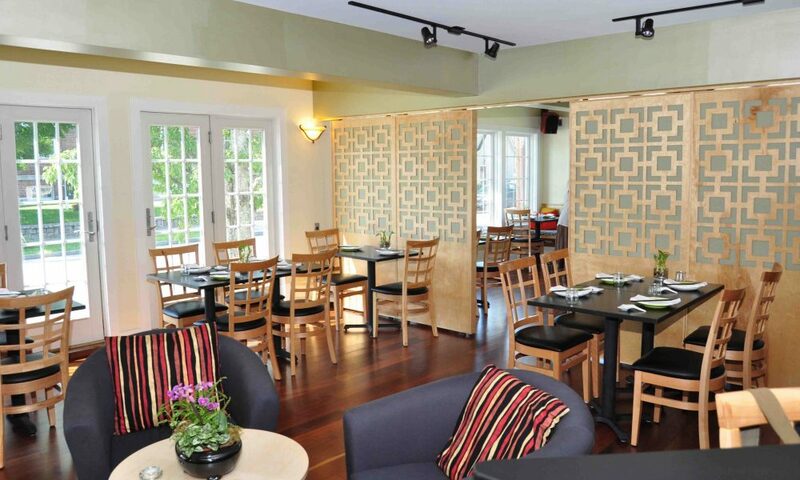 We are pouring their 2013 Pinot Noir from Jessie Vineyard , a fuller-bodied representation of Pinot Noir. At first taste we realized this wine would be a spot on pairing with a New York strip we have coincidentally been aging. 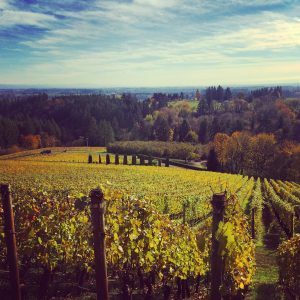 The more I’ve researched Oregon grape growers and wine makers, the more I see the spirit of the Pinot Pioneers having a continual influence on Oregon. People are continuing to take chances and from what I have found they are doing it out of passion and love for the grapes. As I delve further into my wine education, the most exciting and daunting thing is there will always be more to know. There are endless grape varietals and regions to study and more stories of winemakers and their passion to discover. I am looking forward to the continuous exploration.